When it comes to beef stew, I find the best cut of beef to use is beef chuck. 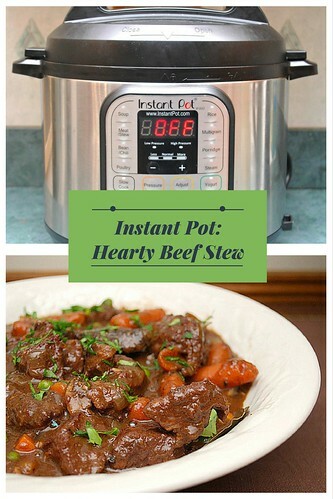 It's perfect for long, slow cooking and absorbs flavors really well. This recipe starts out with browning the cubed beef to get some color going as well as building up some flavor with the fond (the little brown bits from cooking the beef). Flour is sprinkled in to help the create a thickener for the stew and then the pot is deglazed with red wine and broth. Aromatics are added, including bay leaf, fresh thyme and soy sauce. After a quick stir, the stew does it's magic as it pressure cooks. Once the beef is tender, baby carrots and mushrooms are added and continues to pressure cooks for a little bit more. Just before serving, frozen peas are stirred in and warmed through. And after all that patience, it's finally time to dig in! This goes very well with a Mashed Potato Casserole, which I served with the stew. 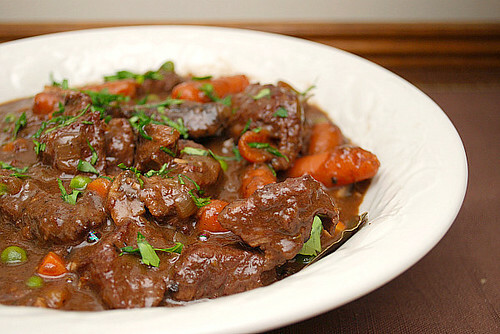 And just as they say with wine as it ages, this stew is even better the next day! Season the beef with salt and pepper and dredge in flour to coat. Shake off any excess. Press SAUTE and add 2 tablespoons oil into the IP. When hot, add the seasoned & coated beef in batches to the IP in a single layer and brown on all sides. Remove browned beef from IP and transfer to a plate; set aside. Repeat with remaining beef. After all the beef has been browned and removed from the IP, add the remaining oil, onions and garlic to the IP and sauté until softened, about 5 minutes. Add tomato paste and cook, stirring constantly, until fragrant, about 30 seconds. Return beef to pot and add flour, stirring constantly, until no dry flour remains, about 30 seconds. Slowly add wine, scraping bottom of pan to loosen any browned bits. Allow wine to simmer until thickened and slightly reduced, about 2 minutes. Stir in broth, bay leaves, thyme, and soy sauce. When the IP beeps after pressure cooking for 35 minutes, allow your IP to naturally release pressure for 10 minutes. While naturally releasing pressure (also known as NPR or NR), the display will reflect numbers counting up from 1. The numbers indicate how many minutes the IP has stopped cooking since it beeped (or how many minutes it has been naturally releasing pressure). No need to touch your IP while it naturally releases pressure. The pin at the top of your IP will drop when all pressure has been released and it's safe to open. Discard bay leaves. Stir in the baby carrots. Serve hot and with your preferred sides.